The media lied to me! Despite my massive consumption of their much-touted ‘superfoods’ – mainly in the form of cheap sushi (fish oils!) and things with cranberries baked into them (antioxidants!) – I have somehow come down with a sniffly nose, scratchy throat, and a case of flu denial. Sure, I didn’t get the flu shot, but I reasoned that I am tough and such. This is clearly just a minor cold and will be gone by tomorrow. Anyhow, even though the cookies I’m about to talk about didn’t save me from this cold, they are still definitely worth making. 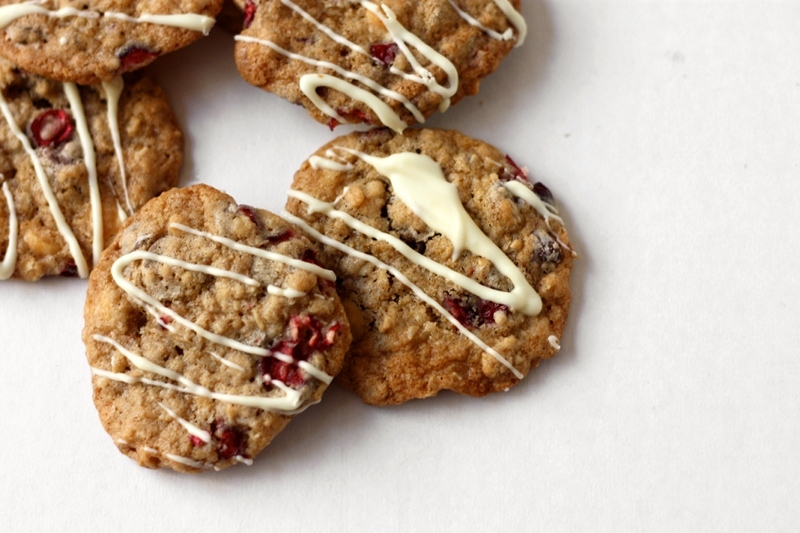 They’re an awesome oatmeal cookie packed with three kinds of chocolate chips and fresh cranberries, and then drizzled with more chocolate to top it all off. They tasted wonderful. They had that great sweet-tart combination you get with cranberries, and they were sooo crispy and delicious right out of the oven. I was worried that they would get hard overnight, but they actually stayed soft for quite a few days. Also, they’re really pretty! 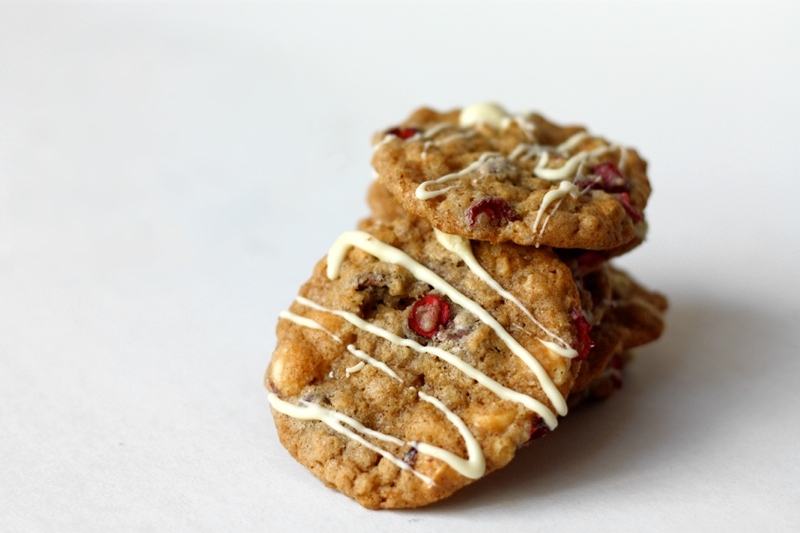 Much fancier than a typical chocolate chip cookie, but just as easy and delicious. They’re an excellent addition to your holiday baking, and a great gift as well. I gave some to a friend and he liked them so much that he ate five for breakfast. Although he did regret that. Whisk flour, baking soda, cinnamon, and salt in medium bowl to blend. Using electric mixer, beat butter and both sugars in large bowl until smooth. Beat in egg and vanilla. Add flour mixture and oats and stir until blended. Stir in all chocolate chips and cranberries. happy holidays! i hope you have a great new year! Anyways, just wanted to check in. I hope you’re doing well. I see your dad occasionally when my parents are in town and I am witness to his non-stop Laura-bragging… which is very well deserved. You have accomplished a lot in the last 10+ years. Keep in touch. wow, good to hear from you! and thanks a lot. I’m a bit mortified that my dad’s been bragging about my random food musings, but I guess it’s a compliment. hope everything’s good with you! 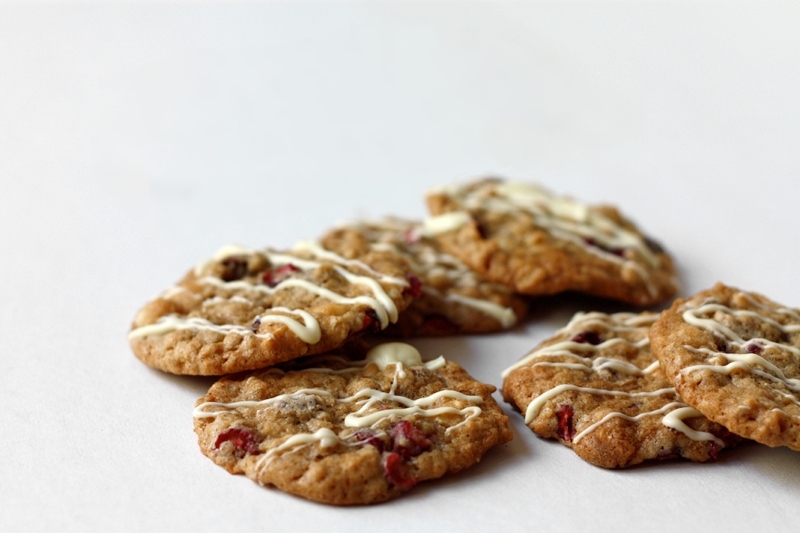 You are currently reading triple-chocolate cranberry cookies at one cake two cake.